Waterford Leighton Decorative Pillow, 12" x 18"
WaterfordLeighton Decorative Pillow, 12" x 18"
Midnight blue over scaled matelassé geometric design. 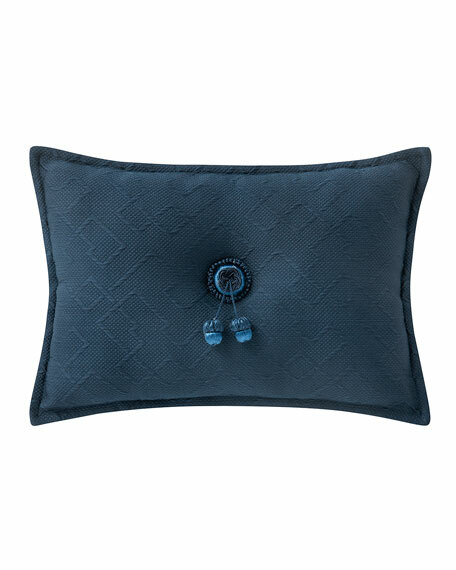 Jeweled toned checkered chenille design in midnight blue and emerald on the reverse. Framed with a flange. Tufted in the center with acorn buttons. Handcrafted bolster pillow in faux fur (polyester/acrylic). Hidden zip closure. Removable feather/down insert. 14" x 42". Dry clean. Made in the USA of imported materials. Handcrafted decorative pillow. Cover, polyester/Lurex?? metallic fiber. 22"Sq. Dry clean. Made in the USA of imported materials. EXCLUSIVELY AT NEIMAN MARCUS Handcrafted woven pillow. Rayon/polyester. Feather fill included. 13" x 22". Dry clean. Made in the USA of imported materials.